For a few weeks running now, we have been covering the subject of multimode optic installations, something which used to be standard practice in very many 20-year old buildings. In those days, they were mainly of the OM1 (62,5/125) and OM2 (50/125) type, which were widely used at the time, for such purposes. So far, so good, if you consider that they were initially intended to work in network plans designed for speeds of up to 10 or 100Mbit only. Even switching to 1G Ethernet, did not present much of a challenge either. 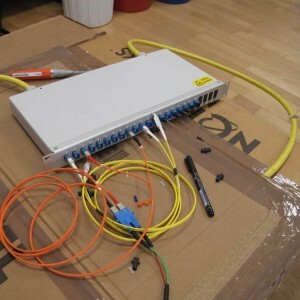 Nowadays, due to increased pressures on bandwidth requirements to the net, all this has changed, specially in the case of Access Switches, now requiring 10G Ethernet for a smooth and efficient run. However, it is important to observe that the maximum distance achievable with OM1 and OM2 are of 33metres and 86metres, respectively. For the purpose of this discussion, it would pay to make a mental note of these two figures whilst drawing up an imaginary plan of the inside of a building. You will very quickly come to the conclusion that we are talking about distances well over 100metres in length. This was often the case in the past, since fiber optic cables were always laid when the 90 + 10 metres were no longer attainable on Cat5. ’’If 10G is needed over 100metres, you need to lay OM3, or better still (please read here, better for the manufacturers), OM4 optical cables”! We did not want to leave these statements unchallenged since it is common knowledge that the replacement of fiber is an enormously time-consuming affair without even mentioning the subject of spiraling costs. This is why we decided to run some tests on these old optical cables to see whether we can break the OM2 86m sonic wall, using standard optics. Guess what? It worked! On the one hand, our test configuration was really straightforward, on the other, the procurement-side-of-things was rather laborious,though.We took a 15-year old installation cable with 24 fibers totaling 80m in length and spliced these into various cascades (on the whole, we were meticulous in our approach and ensured that all components and plugs were mechanically aged, respectively.) Each cascade was fitted with an SC connector and the whole was placed inside a patch panel.This way, it allowed us to patch a multimode link from 80 to 1920 metres. We transmitted a 10G signal through these various lengths which was generated by a 10G signal generator. At the end we placed a 10G Bit Error Rate Tester (BERT) and compared the outgoing sample signal with the incoming one. In other words: a typical BERT. On the 80metre cascades, the distances were continuously extended.This was carried out until a failure rate of 10-13 could no longer be achieved (10-13 is a true BERT failure rate indicator for 10G Ethernet). The outcome surprised even ourselves! We were able to achieve 10G on a distance of 640metres and 1740 metres, respectively. 24 x 50/125 optics spliced into various cascades onto a patch panel and patched as and when required. Which ‘’other’’ additional components were used in the installation? What we did first of all, was to take a 10G XFP LR with 1310nm generated by a DFB Laser. This took us to the above-mentioned 640 meters! The 1700 were achieved by using 10G XFP ER at 1550nm.In addition to all of this, we also used a mode conditioning cable when coupling the laser. The conclusion we should draw from this is that you should not always believe the cable lobby and that you should feel free to consult us at any time in the case of an infrastructure test run. The entire thing was kindly supported by Dirk Spieß, a distinguished expert in the field of passive optical fibers. He spliced the distances and measured each and every single one with the help of his OTDR aid. Disclaimer: We cannot assume that this setup is the same for all fibers installed in the field.We continuously made sure that all components were as old as possible (this did not include the transceivers). There will of course be instances where this cannot be achieved. It is at least worth a try before attempting to rip out all the old fibers from the wall before replacing them by new ones! Update: Last week, I was involved in a project where 300m long OM4 fibers were laid. They had recently been measured by the OTDR device too. The protocols looked very good. However, it was not possible to establish a link with the original 10G SR Optics. This is rather amusing since OM4 standards officially state that 10G over a distance of 500 metres should, albeit in theory, be achievable. We helped our client by installing the 10LR optics. A link was established (after having stood idle for over 5 months! ), 10G per second was achieved over the new distance! The manufacturer confirmed ‘’off the record’’ (unfortunately, we have nothing in writing to prove this conversation took place) that from 250 metres onwards, the use of singlemode fiber is recommended. I can’t say it for sure but you can give it a try. Take 10G LR transceivers (SFP+ or XFP) and link them over your OM1 span with OM1 patch cords only. If you don’t see errors (CRC) and the link is stable (not flapping) than it is fine. Let me know if it worked. Yeah we were getting alot of CRC errors, the patch cords are looking like the issue (were using SM patch). I switch to OM1 fiber patch cord and was able to send 48gb of data with no crc errors… And no errors overnight, we have been getting disconnects and CRC every few hours. And its working at 10gb! Need to give it more time to verify its good but its looking better already. Thanks so much for this analysis! Somewhat mindblowing since I was also indoctrinated to replace all orange cable with aqua as the first step on the 10GB journey! What about plain 10GB SR modules? I believed the 33m and 82m limits of OM1 and OM2 were formulated using SR as the optic type. Do you know if using plain SR these limits could be exceeded reliably? I see some anecdotal evidence that they can, but wondered if you had done any tests. correct, plain 10G SR modules have the 33m limit for OM1 and 82m for OM2 – defined by the IEEE. So this is the minimum requirement a 10G optics needs to achieve. In the real world we have seen installations beyond 100m on OM2 and these installations are error free. We haven’t done testing with plain SRs as we think that people perform these tests anyway before they dig the ground for new fiber. on my Twitter. Thanks again for a great post! We have two building which is B2 and B5. The distance is about 300M away. We have currently 2 old OM1 and OM2 fiber connected between 2 Cisco switches 37 series and 36 series from B2 to B5. There are some spare ST connector left in the patch panel. So we think to make use of them instead of laying new OM3 cables. Now, we have 2 new C3850 switches in place. We want to go with 10Gb. If we use the SFP-10G-LR (SFP+) transceiver, does it work to connect with OM1 or OM2 which run on MM only ? I taught SFP-10G-LR (SFP+) support only SMF? Could a 10G LRM overOM2 able to reach around 275M~300M? Understand in theory, OM2 can only reach 86M ? Thanks for that excellent work! Did anyone test, if it's possible to use two or three LR-CWDM lambdas in parallel over OM1/2? no, I doubt that you will get a CWDM Mux successfully in place here as the inner fibers of the Mux are singlemode - This will end up in a high loss. Nevertheless some people made tests with with regular 10G BIDI via OM2 fiber. This worked quite well. We are now succesfully using the 10G SFP+ LRM Flexoptix modules on a OM1 cable of around 200 meters. You do however need the special mode-conditioning OM1 cables.